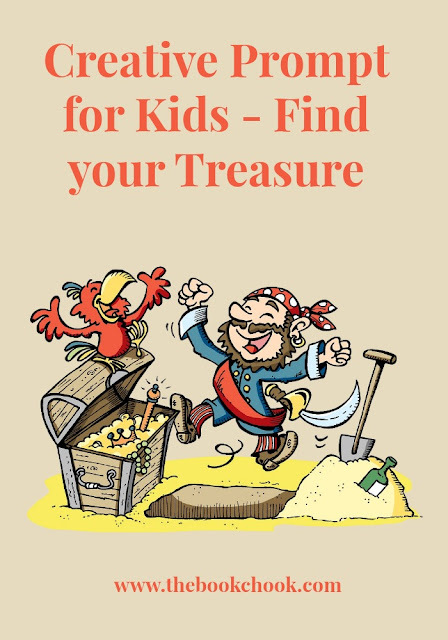 Because the Children’s Book Week theme for 2018 in Australia is “Find your treasure”, I’ve brainstormed some prompts that use the idea of a “treasure” to nudge kids towards some kind of creative activity. The deal is to use my ideas simply as a springboard to any kind of creativity, and the more, the better. Whether kids are drawing, composing music, designing graphics, embroidering, sculpting, choreographing, writing, telling digital stories, decorating a cake, making a movie or designing the set for a play, they are thinking creatively and expressing themselves. And that’s worth more than any treasure I can think of! Far below, you’ll find the 2 page list of all my other creative prompts for children. * There is treasure in the story about Jack and the Beanstalk. There are bags of gold, a golden harp and even a hen that lays golden eggs. Choose one way of re-telling the story. You might decide to tell a younger friend out aloud. You could create a video with an app like Quik, record your voice with an app like Chatterpix Kids, or use a microphone and a stage to reach a wide audience. You might decide to create papier-mâché or sock puppets and have them help you re-tell the story. * Describe the best treasure you can imagine. What would you do with such a treasure? Draw and write about it. * What if you found a treasure map, hidden in an old book? Would you seek the treasure? What might happen next? * If you were a pirate, you might think treasure was very important. But your pirate ship would need a flag. Design the kind of flag you would like your ship to have. You could include some symbols that are important to you as a reader or a sport-player. * A dragon is guarding a treasure. How can you and your friends distract the dragon, so you can sneak into its cave and steal the treasure? What happens next? * Create a dance about someone who has treasure and another person who wants it. * A magic creature promises you whatever you wish for when you release it from its prison. You wish for unlimited treasure. What could go wrong? Choose one complication and work out a resolution for it. * How could you make fake jewels and gold? Create your own box full of “treasure” and then make up a play centred around it. Act it out with your friends. * Create a story about some LEGO characters that involves treasure. Set up scenes to help tell the story with LEGO and photograph the scenes. Use technology you have access to, that will help tell your story digitally. You could also try this activity by using modelling clay to create characters and props. * Your great-grandfather has left you a very old, tattered map. It seems to be of the land behind the house where your great-grandfather lived, and there is a large X in one section of the map. You suspect it is the secret to what happened to your family’s treasure. The problem is that land now belongs to the Army and there are signs all along a high fence telling people to keep out. What will you do? Tell the story any way you choose.